The Breville is a popular brand in many parts of the world, known for its product durability and sturdiness. This model is slightly smaller in built which is why it’s called the “Compact Juice Fountain”. However, the high RPM packed into it is certainly not compact! As with Breville’s newer model, the design is pleasant aesthetically, made to have that modern, appealing look. Wide chute: It has a 3-inch wide feed chute big enough to feed a whole (small) apple. (Another of Breville’s patented feature). The wide chute makes for plenty time-saving from having to cut the produce (e.g. carrots, tomatoes, small pears, etc.) to smaller pieces. Design: Its compact design means it has a smaller footprint and is space saving, compared to Breville’s other huge models. 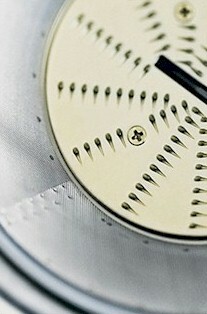 The design is rather modern and stylish too. Noise level: For a centrifugal juicer, this BJE200XL does seem to be a little quieter. 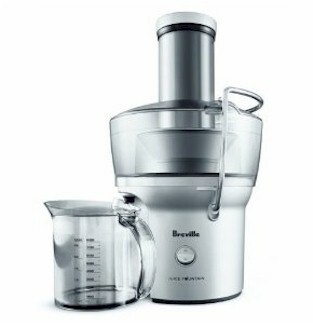 Inexpensive: This model is in Breville’s lowest range of juicers at a price that’s just only a little under US$100. This is to attract beginners, and consumers that are on a low budget. Probably good if you only use the juicer occasionally. But, if you’re going to do regular juicing, my advice is for you to pay a little more and invest in a gear/masticating juicer if you can. It will save you a lot of hassle. Speed: Fast is good if you’re juicing for fun. But when it comes to serious juicing for health then something will be compromised. At this very high speed, the exchange of +ve and -ve ions during the spinning, oxidation of juices occur at a rapid rate, destroying enzymes and nutrients. It’s not heat that destroys enzymes as it has most often been mistaken, but the spinning. Very soft fruits: As with all centrifugal juicers, they are not very good with juicing small or very soft fruits like tomatoes, and most berries (e.g. raspberries, cranberries, blueberries). Due to its high speed spinning, and the lightweight of these fruits, the fruits get flung out either through the pulp spout or through the feeding chute, even before they get chopped up for juice extraction. This is something to consider when buying a centrifugal juicer. You don’t want to waste your expensive fruits like this. Froth: Due to its high-speed spinning, there is a lot of foam produced for every glass of juice. Some users even reported that the foam is as much as ¼ of a glass! But there is also a froth lid that comes with the juice collector pitcher to separate the foam. Some people don’t mind the froth, but I personally don’t drink it as it adds unnecessary “gas” into my digestive tract. Wet pulp: This is a common complaint with this model. Produce fed into the juicer is being spun so hard and fast and flung out just as fast, due to its high speed spinning. Because of this, juice pulp are often still wet and some users even complained of chunky fruits not being juiced. This means less juice yield and a lot of wastage. With the prices of fruits and vegetables continuously rising, you might want to look for a juicer that provides you high juice yield and real cost-saving in the long run. Is speed really that important? Pulp container: The pulp container is built-in, not an external container which you can easily empty away. After a short time juicing, the pulp container fills up and you have to stop the operation, remove the cap, the strainer basket to empty the container. Certainly not a heavy duty machine if you’re juicing for more than two persons. Messy: Due to its very powerful motor and very high-speed spinning, produce gets flung out from the feeding chute. Make sure you use the food pusher or your palm to cover it when feeding produce to avoid it splattering your kitchen ceiling! Warranty: Warranty period is only for one year limited. Whereas a gear juicer could give you between 10-20 years warranty on the motor, which by itself is already a worthwhile investment.